ST. PETERSBURG, Fla. -- Mike Moustakas, who clubbed a combined 36 home runs with the Northwest Arkansas Naturals and Omaha Royals, is this year's winner of the Joe Bauman Home Run Award, presented by Musco Sports Lighting. The third baseman finished tied for the Minor League Baseball lead in regular season homers with Salt Lake's Mark Trumbo. Moustakas, who turns 22 years old tomorrow, was declared the winner using the first tiebreaker of more RBIs because he drove in two more runs (124-122) than Trumbo. Moustakas will receive the Joe Bauman Trophy and a check for $7,200, representing $200 for each homer he hit, at the Baseball Winter Meetings™ Awards Luncheon on Dec. 6 at the Walt Disney World Swan and Dolphin Resort® near Orlando, Fla. 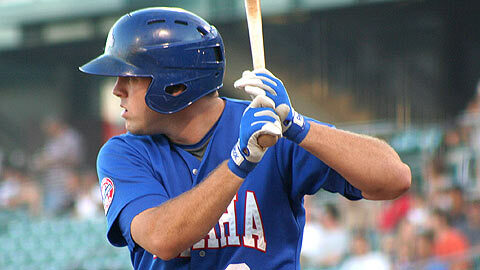 The Kansas City Royals drafted Moustakas, who was named to the 2010 USA Pan American Qualifying Team roster yesterday, with the second overall pick in the 2007 First-Year Player Draft. The left-hand hitting slugger smacked 21 homers in 66 games for the Naturals in the Texas League, before earning a promotion in July. He hit another 15 homers with Triple-A Omaha in the Pacific Coast League, including three on Aug. 28, the same day he was named the Texas League's Player of the Year. The top home run hitter in each classification level, provided he is not the overall winner, receives $500. Trumbo of the Salt Lake Bees is the winner in Triple-A. Joel Guzman of the Bowie Baysox hit 33 to lead Double-A. Visalia Rawhide first baseman Paul Goldschmidt finished just one homer behind Moustakas and Trumbo with 35 to capture the Class A prize. The RBI tiebreaker was also needed to determine that Ogden outfielder Nick Akins is the Short-Season/Rookie classification winner. Akins and Jamestown's Marcell Ozuna each hit 21 homers, but Akins plated 70 runs, compared to 60 for Ozuna.